Inspired by my love of all things autumn, this bundle is a perfect fall palette filled with rich, saturated colors that you can use as an inspiration stack or to add into various fall projects to give them even more loveliness. This scrumptious autumn grouping contains (11) 1/2 yds. 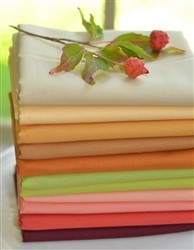 of MODA BELLA SOLIDS that we use all of the time to complement our collections and I think are the perfect addition to your stash. I think would look absolutely amazing mixed in with our favorite autumn flavored Fig Tree fabrics!